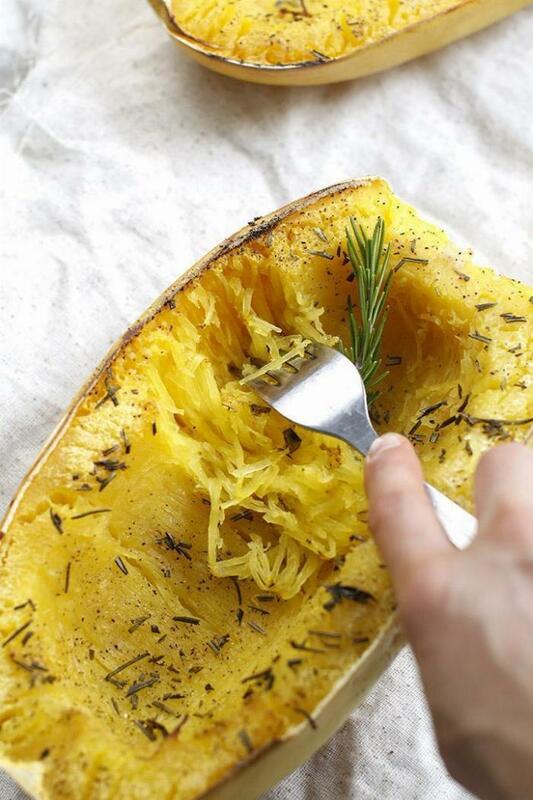 A recipe on how to cook the healthiest and simplest spaghetti squash! Simple preparations allow the aromatic rosemary and olive oil seep into the juicy squash for the freshest dinner or lunch. 1Preheat the oven to 400º. Cut off the end of spaghetti squash with stem. If too hard to cut, microwave for 5 minutes to soften. 2Cut the squash in half, lengthways. Scoop seeds out with large spoon. 3Pull the leaves off the rosemary and chop. 4Line a baking sheet with parchment paper or foil. Drizzle inside of squash with olive oil and spread evenly, including edges. Sprinkle with rosemary, salt and pepper. 5Lie facedown and roast for 45-60 minutes. Large ones will need maximum time; smaller ones, less time. Flip over when done and let cool enough to touch. 6Use a fork to scrape squash in the direction of the "grain". "Noodles" will break away. 7Drizzle with more olive oil. Salt and pepper to taste. Serve with optional toppings. Reheat leftovers, or keep cold and add to salads.